I would say my style is comfy and cute. The most important thing for me is the way something fits and feels on my body. I love combining a nice pair of jeans with either comfortable heels or some cute boots. What is a favorite clothing item or accessory that you own? I have this amazing dress that my aunt gave me that came off the runway from BCBG. I haven’t had the opportunity to wear it yet, but I smile at it in my closet every day! Where are all the pieces from that you are wearing today? My jeans are from Target, my boots are from Charlotte Russe, the coat was a gift, my sweatshirt is from the college I graduated from and the scarf is from a Paris street vendor. My purse is Dooney & Bourke that was gifted to me from my grandma. 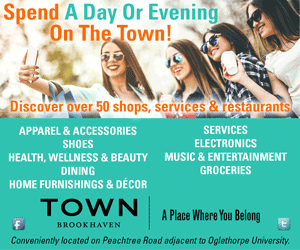 Where is your favorite place to shop in Atlanta? When I am really feeling fancy and in need of something nice, I enjoy shopping and browsing around Lenox Square. If I just need something simple or quick, my go-to is Target. What is your lazy day go-to outfit? If I’m being lazy at home, then I’ll probably just be in a comfy pair of sweats and a bra. When I have to step out, I’ll probably throw on one of my t-shirts from Friendly Human, which is [the video production company] where I work. They are the perfect lazyday work attire because they are cute and cozy. What is your favorite fashion trend right now? I really love long, tall boots. They’re versatile and flatter any body type. They look great with a pair of skinny jeans or even with a flowy dress. I’ll always be a big fan of heels, and the higher the better! I have always gotten grief for being tall, so when I put on a pair of heels, I just want to go for it…and go high! If you could trade closets with anyone, who would it be? I would definitely have to say Janet Jackson. She has always been my biggest style icon. She can make even the simplest outfit look amazing and capture all the attention in the room. Everything she wears and does is simply stunning.